Me: On a scale of one to ten, what are the odds you would buy a farm? Me: Really? Wow, that’s not too bad. I thought you were going to say negative 12. Him: I like animals. We just need to wait 15 years. Me: We’ll be too old to do the work then. Him: We’ll get other people to do it. Like our lawn service. We’ll have a cow service. A pig service. Uhh, not what I had in mind, but then again I don’t know what I had in mind, exactly. Friday the kids and I had a nice trip up the avenue. 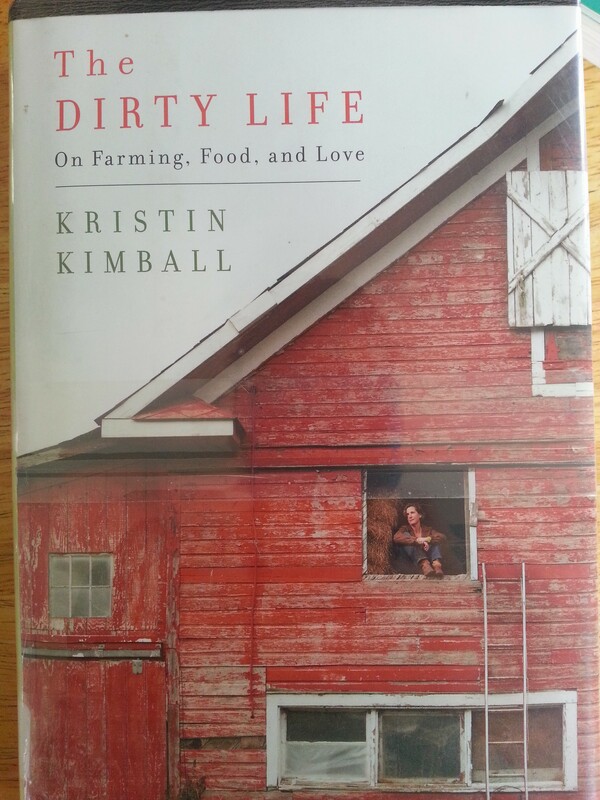 We started off at the library and I was able to get a book I’ve been wanting to read since even before Vermont: The Dirty Life: On Farming, Food and Love by Kristin Kimball. Do you ever find yourself making faces while reading a book? I started out with a goofy grin, my mouth hanging open a little, while reading the part about how she falls in love with this farmer and gives up New York City to move to far northern New York state and turn this old farm into a working farm/CSA again. So romantic! I could do that! Then by the time I got to the middle of the book, my lips were curled up in horror while she talked about how exactly black pudding is made, and how tasty it is. Not to mention watching a cow eat the afterbirth after calving. I should probably stick to chickens and vegetables. Maybe some nice apple trees. Anyway, it’s a good book. 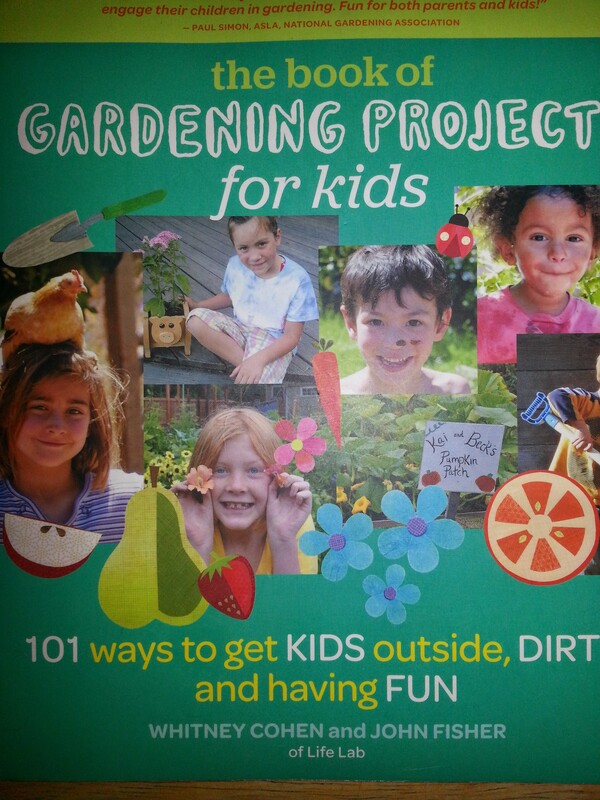 I also got a book about gardening with your kids, which so far is making feel guilty for all the times I’ve yelled at them to not step on the plants. It definitely has some good ideas, though. We had a productive trip, picking up school supplies at the variety store and the Rite-Aid, as well as a snack at Wawa. I checked The Nesting House for a secondhand umbrella stroller, since recently the seats frayed through on both of mine at once, but no luck. 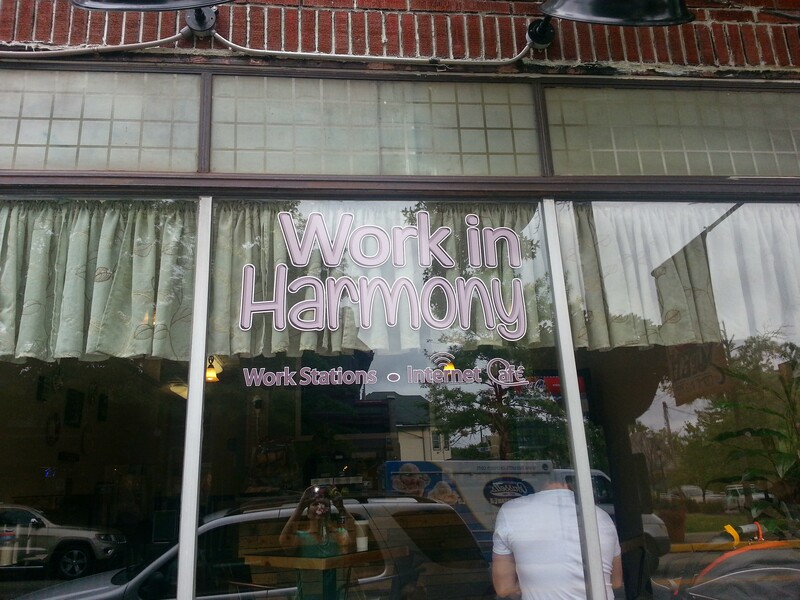 I also checked out the newest storefront, a place called Work in Harmony, which has coffee and pastries and also rooms and computers for rent. 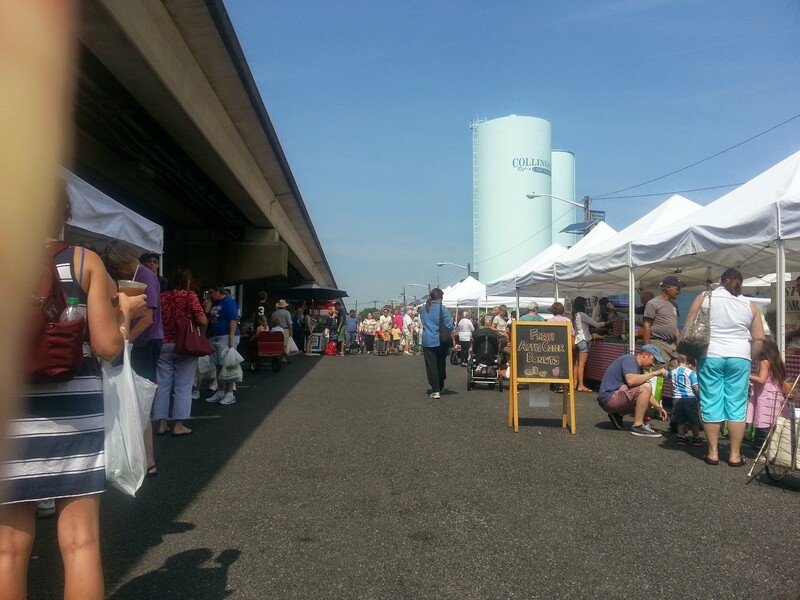 Saturday, I trekked through the farmer’s market in the rain with the oldest and the youngest. The drizzle kept the crowds away, which made it more pleasant for us. 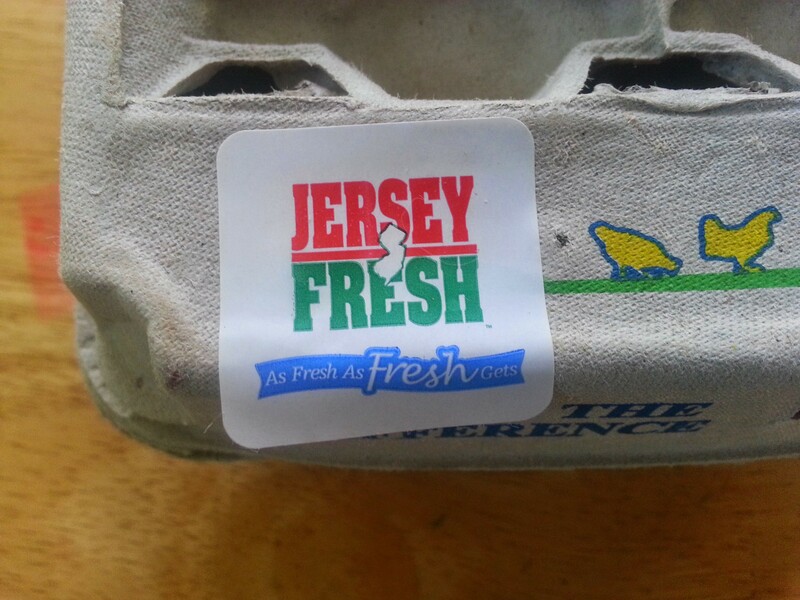 We picked up corn, carrots, and Romaine lettuce from various farms, and eggs from FAR Wind Farm. 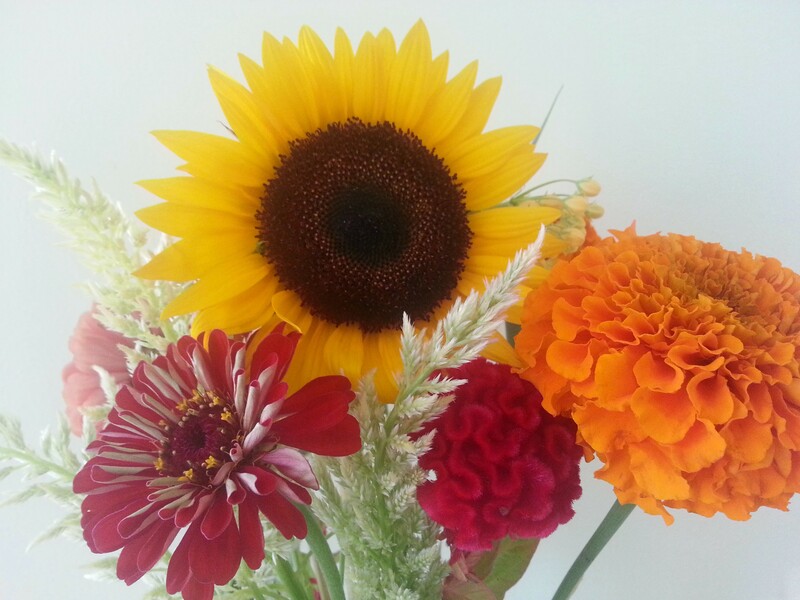 Also some beautiful flowers. I’ve been letting my oldest do the transactions and pick stuff out. Saturday afternoon into Sunday, all I did was get ready for my daughter’s third birthday party, which was Sunday afternoon. I was really trying to do this party on the cheap, after that little Toys R Us spree. I think I did pretty good. Her dress was something I had picked up quite a while back on eBay. I went to the party store, but only spent $20, mostly on balloons, crepe paper and a big Hello Kitty helium balloon. The only disposable party stuff I used was pink and purple paper drink cups that were $1. No throwaway plates or silverware. So there wasn’t much of a cohesive theme beyond pink and purple, but it looked festive, at least. All the side dishes were brought by family members. I also made lemonade. Ice cream, chips, pretzels, soda, etc. were bought at ShopRite, mostly on sale. 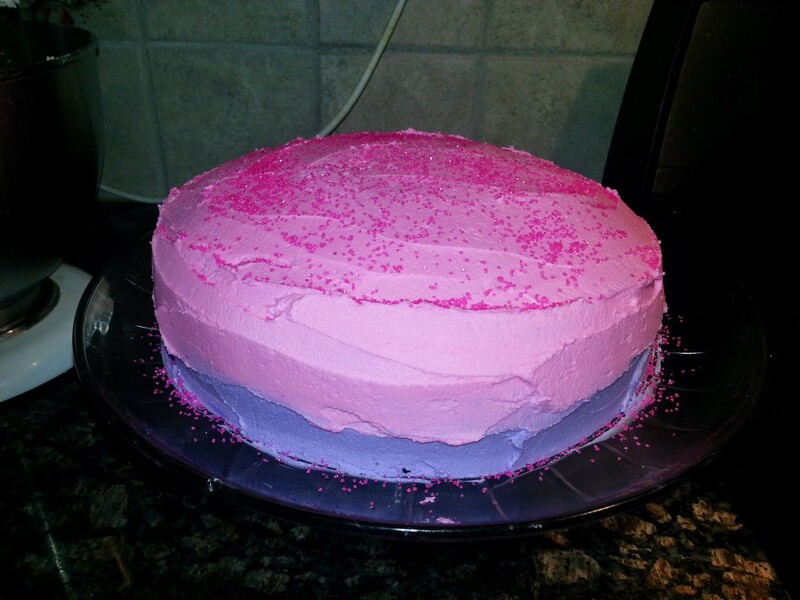 I made her cake using this recipe, but with two 9-inch cake pans, because I didn’t feel like going to the craft store with the kids to get 6-inch ones. The kids really lose their s— in craft stores. I was pleased because the cake didn’t stick to the pans at all and I was able to saw some of the dome shape off. It was probably the least lopsided cake I’ve ever made. I also did a crumb layer of frosting for the first time, which made me feel very professional. It tasted good, but I think in the future I would not use shortening in the frosting, as the recipe called for. Something about it bothers me. 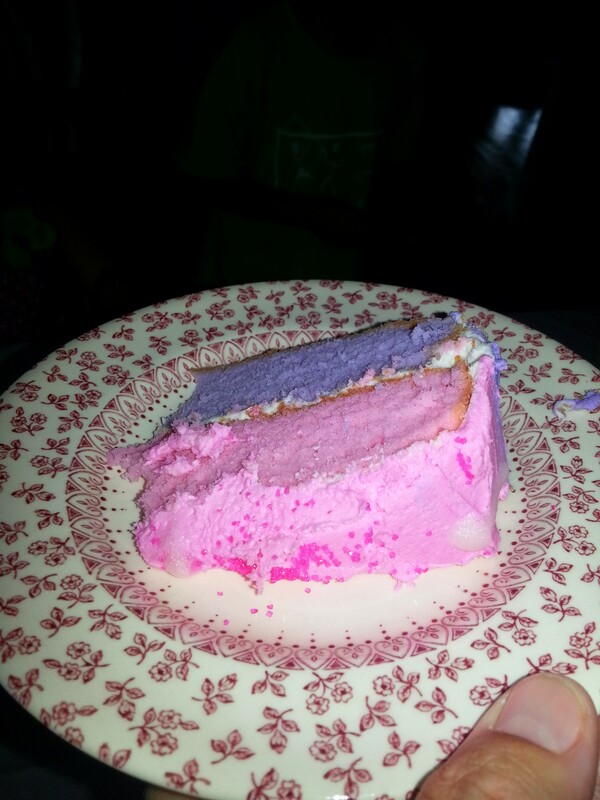 I also, for the first time ever in my baking life, felt a little off-put by the unnatural colors. My only complaint about the party is that my husband nixed barbecuing at the last minute in favor of ordering food, leaving us with a lot of hot dogs, hamburgers and rolls. Guess we’ll be having a Labor Day BBQ. Ten days til school starts! I got my middle son enrolled in a three-days-a-week program, FINALLY. Nothing like waiting til the last minute.